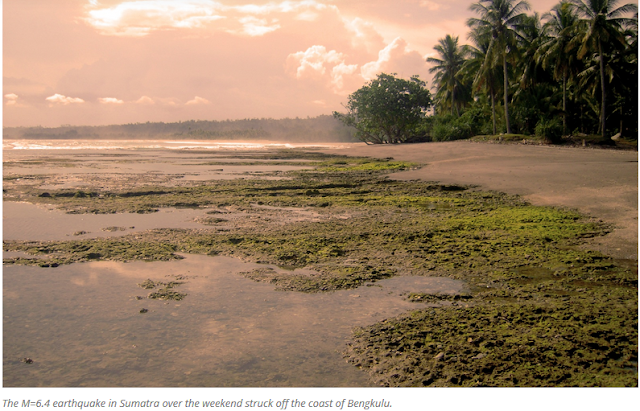 Over the weekend, there was a M=6.4 earthquake off the coast of Sumatra in Indonesia. Despite the quake’s magnitude, because it struck offshore, 74 km from the city of Bengkulu, and at a depth of 36 km (according to the USGS) it did not cause any major damage. However, shaking did last approximately 10 seconds, and was severe enough to result in power outages, knock objects off shelves, and cause people to flee from their homes. Based on the focal mechanism and depth of this earthquake, it likely occurred on the Sumatra-Andaman plate boundary slightly above the subduction zone. This Temblor map shows the location of the M=6.4 earthquake off the coast of Sumatra. Despite this quake’s magnitude, because it occurred offshore and at a relatively deep depth, it did not cause any major damage. The Sumatra-Andaman plate boundary is a collision zone between the Indo-Australian and Sunda plates. This subduction zone extends for over 8,000 km and has been responsible for large, damaging, historic earthquakes. For example, in 2004, a M=9.1-9.3 earthquake struck off of Banda Aceh. This earthquake ruptured a ~1,600 km-long portion of this plate boundary, and the shaking and ensuing tsunami killed over 200,000 people. In addition to this great earthquake, there have been several M=7.3+ earthquakes in this region since 2000 (see figure below). This figure from Caltech shows the rupture areas from great earthquakes off the coast of Sumatra. What can be seen is that the earthquake over the weekend occurred on the edge of the rupture zone of a 2007 earthquake. While just a hypothesis, this could mean that it is a late aftershock. What the above figure from Caltech shows is that the weekend’s earthquake occurred on the edge of the rupture zone of the 2007 M=8.4 earthquake. While just a hypothesis, this could mean that the earthquake over the weekend was a very late aftershock. What is also interesting is that there is a large gap between the two 2007 ruptures and the 2005 M=8.6 rupture zone. If one looks at the two Temblor maps above, you will see that there is not a large amount of seismicity in this region, while to the south, there is. While this could be purely coincidental, it is worth noting as it could be indicative of differences in subduction along the plate boundary. Based on the Global Earthquake Activity Rate (GEAR) model, the weekend’s earthquake should not be considered surprising. This model, which is availbale in Temblor, uses global strain rates and the last 40 years of earthquakes to determine the likely earthquake magnitude in your lifetime anywhere on earth. From the figure below, one can see that for this part of Indonesia, a M=7.0+ earthquake is likely. This highlights the earthquake potential, and thus the hazard of this region. This Temblor map shows the Global Earthquake Activity Rate (GEAR) model for much of Indonesia, with the location of this weekend’s M=6.4 earthquake shown. What this model illustrates is how the weekend earthquake should not be considered surprising as the region is susceptible to M=7.0+ earthquakes.